The Product Increment is deployed in the Staging environment of the Customer, in order to subject it to a set of tests the Customer organization has prepared. Once deployed, the Product Increment is ready to go through a set of tests, executed by the customer. Typically, a functional acceptance test and a user acceptance test are performed. 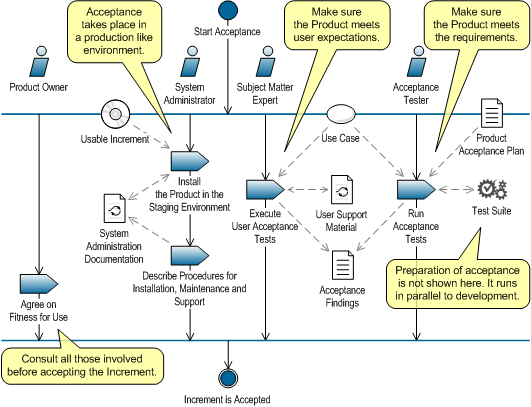 The former is a test in which the functionality is formally checked against the Use Case and acceptance criteria from the Product Acceptance Plan. The latter is a test in which end users and system administrators, typically including the designated Subject Matter Expert, check whether the Increment is what was intended, facilitated by an Acceptance Tester. New or changed insights concerning the deployment procedure are recorded in the System Administration Documentation, in order to have an up-to-date deployment procedure. This procedure is tested every time a new increment is deployed. At this point information needed in the maintenance lifecycle of the product is also developed and if necessary, augmented or changed. Half way the next Sprint at the latest acceptance of the Sprint result is communicated by the Customer. This may include reports of found off-specs and other findings to be solved and the condition that they are fixed or put into the Product Backlog. If reported early enough the team does its best to have all smaller issues (that don’t interfere with their forecast) fixed before the next Demo. Bigger issues go to the Product Backlog. If the Customer does not react within this term, the Increment is implicitly accepted. Later findings automatically go to the Product Backlog. In this way, cyclic customer collaboration is stimulated. 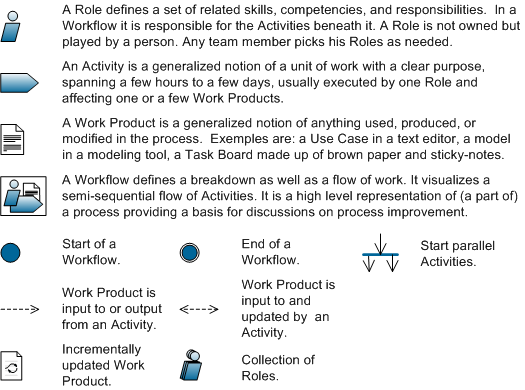 Figure 48 gives an overview of stakeholder roles and team roles and the work products they collaborate on to get stakeholders (customer, users, administrators) to experience and familiarize themselves with the product. 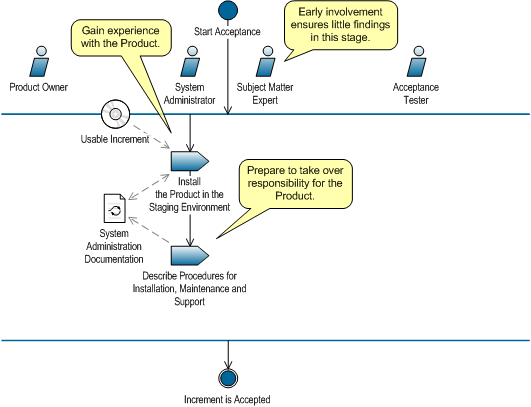 Figure 49 positions the Acceptance Workflow relative to an outline of the Scrum process.